2. Once you are logged in select Account Settings from the naviagation box on the right. 3. 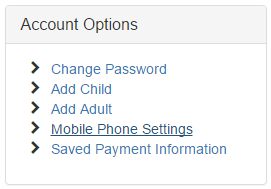 In your account settings, select Mobile Phone Settings from the navigation box on the right. 4. Mobile phones for the logged in user will be displayed, select Enable Texting for the prefered device. If the correct number does not appear, check you account settings and ensure your account contains your mobile number and that it is set as Mobile, and not Home, Office, or Other. 5. From your mobile device, create a new text message and send the message "NEW" to the recipient "698326". You will recieve a responce in a few seconds containing a six-digit code, enter the code you recieved in step 3 and click Save.